When it comes to deciding all of the elements that will take part in your wedding day, one of the biggest decisions you can make is the color palette and mood that you want present throughout your wedding. Think about it- all of your bridesmaids’ dresses, possibly groomsmen ties, table linens, wedding florals (including the bridal bouquet and groom’s boutonniere), favors, wedding invitations and other paper goods seen throughout your day (like your wedding ceremony programs, place cards, seating charts, any wedding day signage), your cake, your guest book, your wedding album, even your parent’s clothing- all have the potential to be based on the colors that you’ve chosen. It’s kind of a big deal! I worked again with my friend Maria Maxit to create a seasonal look to inspire anyone plan the wedding of their dreams. Last time we did this we had a fall inspired wedding reception table, but this time we wanted to do something different. 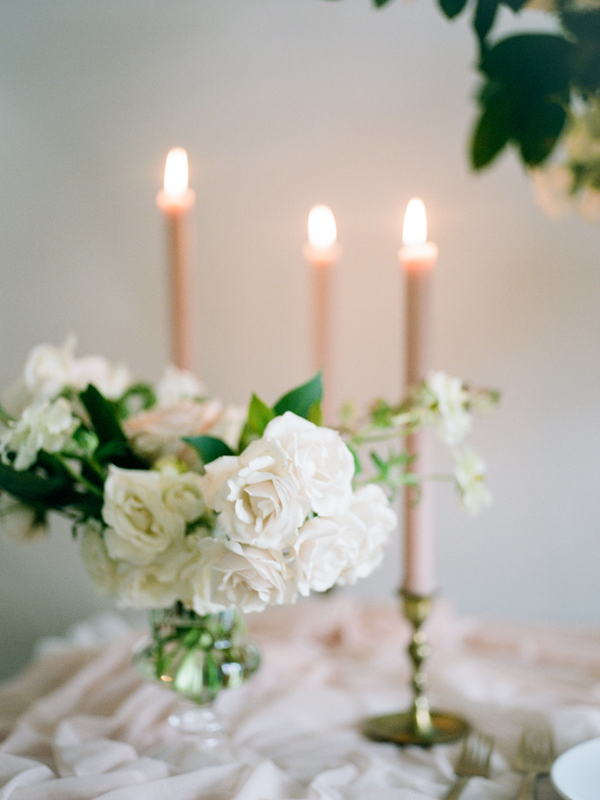 When this color palette was chosen, we had one thing in mind: winter weddings. Sometimes it can be tough to plan a winter wedding when all you see on the internet are more colorful weddings planned in spring and summer, so our intention here was to create a beautiful, achievable look to inspire couples hoping to get hitched in the colder months. The seasonal blooms available during the winter generally lend themselves to the paler side, versus the bright, vibrant warmer month’s blooms. We decided to embrace the season and stick with a pale color palette. 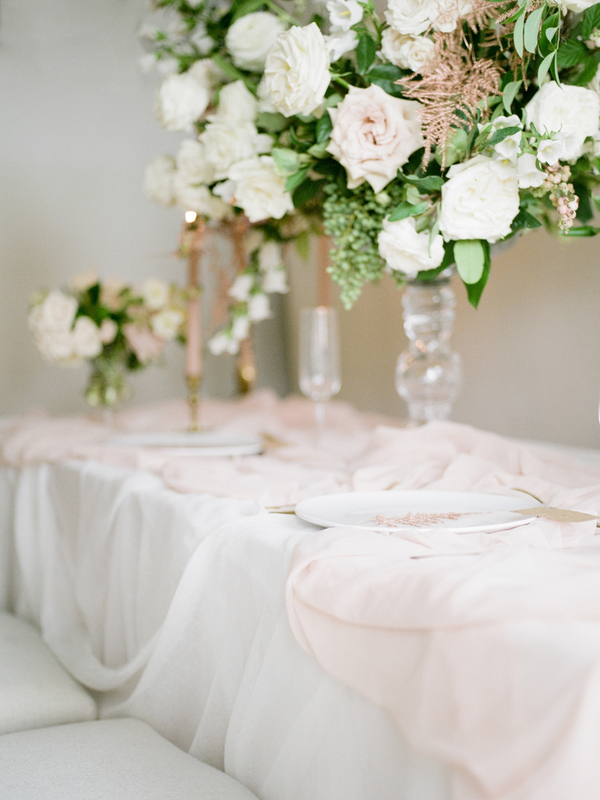 Seen here is white, mauve, light pinks, rose gold, gold, and a touch of greenery. While it’s a cooler palette, we balanced the table out by warming up the table with some brass candlesticks and mauve candles. I think the table would have been too frigid without the candles. The wedding invitation was created by Nicolette of Isidore & Augustine and paired perfectly with the muted tones in the blooms. We styled the snowberries (yes, they’re actually called snowberries!) to mimic falling snow. They were the perfect shade of pale pink and white, and could also be found throughout the floral arrangement on the table.